Born in Bradford, England on 4 January 1868, he apprenticed as a stone cutter before emigrating to Australia in 1887. Returning to England fifteen months later, he then moved to Canada in 1890 and settled in Ontario. 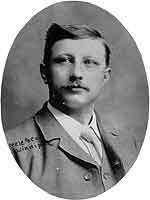 Soon after he relocated to Manitoba where he lived for three years at Brandon then, in 1895, he came to Winnipeg and entered into the marble and granite business of Hooper, Houkes & Company. He married Amelia Charlotte Harland in 1894. They had three children: Lily May Houkes (born Brandon, 1895), Arthur Edward Houkes (born Winnipeg, 1896), and Gladys Annie Houkes (born Winnipeg, 1900). He was a member of the Maccabees.